We’ll be asking WHY Forever Manchester does what it does. A catch up with Forever Manchester Ambassador and Tour De Manc organiser Danny Franks. Further details about the next FM Women Event taking place at the Midland Hotel on 19th April which includes guest speaker Helen Pankhurst. Information on the discounted places for people to take on the Great Manchester 10k Run. 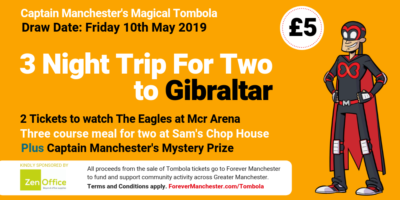 Details of the Captain Manchester Magical Tombola March draw.